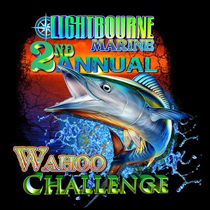 Fish Lightbourne Marine's Annual Wahoo Challenge in beautiful Nassau, Bahamas! Dr. 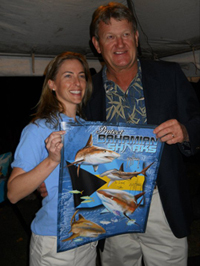 Guy Harvey with Rachel Lightbourne at Shark Conservation Town meeting at the Bahamas National Trust in Nassau, Bahamas". Fishing for Wahoo in The Bahamas is absolutely thrilling. Wahoo (Acanthocybium solandri) is a type of mackrel and happens to be one of the fastest fish in the ocean, clocking speeds up to 50mph. So when a Wahoo strikes your lure or bait, it's usually with strong conviction and the fight to get them to the boat can be a very rewarding challenge. 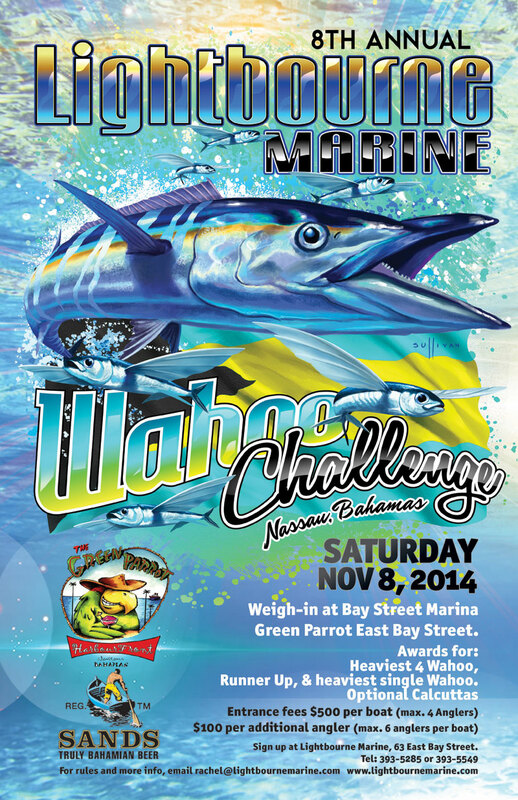 Offshore anglers know that winter time in The Bahamas is definitely Wahoo time. 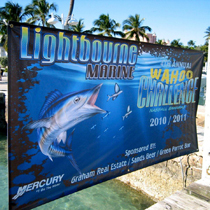 We've hosted this popular annual tournament since 2008 and welcome local anglers as well as those just visiting. 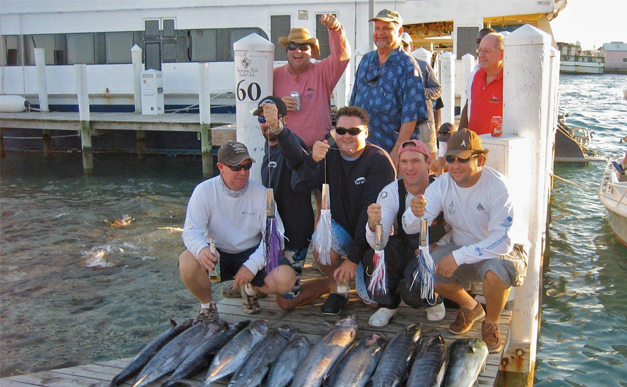 Enjoy a day with friends on the water and have a chance to win stunning hand crafted trophies, marine art, bragging rights, optional Calcutta cash and more. Our tournament also uses proceeds to help the local community. One such donation was a Kohler stand-by generator to The Dunmore School in Harbour Island, Eleuthera. Another was a $3,000.00 donation to The Cancer Society of The Bahamas. 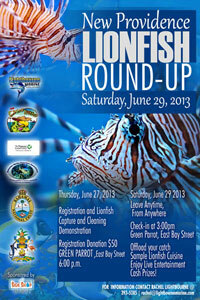 This event is about facilitating camaraderie while fishing the pristine and rich waters of The Bahamas. We hold a casual awards dinner at the Green Parrot Bar & Grill on East Bay Street; serving freshly prepared Wahoo and live entertainment. For more information or help with logistics, please contact tournament director, Rachel Lightbourne at rachel@lightbournemarine.com or (242) 393-5285. Bahamas Calendar - December 11 -17, 2008 - Bahamas events and entertainment from the Bahamas Calendar on BahamasB2B.com. Video features Kristin Marie and an interview with Rachel Lightbourne from Lightbourne Marine. 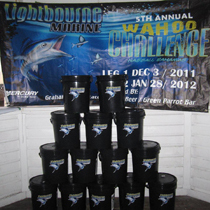 Rachel Lightbourne - IGFA representative Rachel Lightbourne talks about living and working in the Bahamas and creating the Lightbourne Marina Wahoo Challenge. 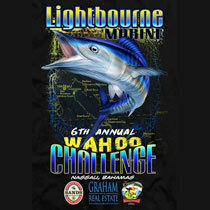 Wahoo Fishing - Part 1 - Mark Melnyk heads out on the water around the Bahamas in search of wahoo. Wahoo Fishing - Part 2 - The night bite is on in the Bahamas! More wahoo fishing with Mark Melnyk. Wahoo Fishing - Part 3 - Mark and Rachel get a double-header as the sun sets in the Bahamas.